We identified relevant studies through a systematic search of Medline and EMBASE until April 2018. In addition, we searched published systematic reviews for additional studies. The search strategy is provided in Table S1. Studies included were randomized controlled trials (RCTs) and long-term follow-up of RCTs that met the following inclusion criteria: participants were adults (aged ≥18 years) at an increased risk due to a previous history of adenomas who underwent polypectomy and with a documented clean colon before randomization; intervention was celecoxib at any dose; the comparator was placebo or control; and the outcome was the proportion of subjects who developed colorectal neoplasia, described as either colorectal adenomas or advanced adenomas. Primary efficacy outcomes of interest were the incidence of recurrent colorectal adenomas (advanced adenomas and any adenomas). Advanced adenoma was defined by one or more of the following features: 1 cm or larger, with villous or tubulovillous histology, with high-grade dysplasia, and/or with intramucosal carcinoma or invasive cancer.29 Any adenomas include both advanced and nonadvanced adenomas (defined as one or two small [<1 cm] tubular adenomas or serrated polyps without cytologic dysplasia)29 and invasive cancers. Safety outcomes were the incidence of CRC, mortality due to any causes, serious adverse events, serious CV events, and renal and hypertensive disorders reported on any follow-up after randomization. Serious adverse events were defined as events resulting in death, hospital admission because of an adverse event, severe gastrointestinal bleeding, CV or non-CV complications, or discontinuation of intervention due to an adverse event or events that were defined as serious or severe by study authors. Serious CV events were defined as the composite of CV death, myocardial infarction, stroke, heart failure, thromboembolic event, or defined as serious CV event by the study investigators. Renal and hypertensive disorders included reports of elevated serum creatinine levels, fluid retention and edema, hypertension, proteinuria, and renal failure. We also evaluated the posttreatment effects of celecoxib on the incidence of recurrent colorectal neoplasia after discontinuing the intervention for >2 years. Two reviewers (SKV and KGL) screened the relevant publications and then extracted data on the study, participants, and treatment-related characteristics onto a standardized form, and discrepancies were resolved by another author after group discussion. Data on efficacy outcomes were extracted with modified intention-to-treat analysis (ie, subjects who received at least one dose of celecoxib at any dose and had at least one colonoscopy after randomization). Data on safety outcomes were extracted by intention-to-treat principle, using the initial number of randomized participants allocated to each trial arm. Participants who were lost to follow-up were considered free of adverse events. Meta-analysis was performed with DerSimonian and Laird random-effects model to estimate pooled risk ratios and 95% confidence intervals incorporating heterogeneity within and between studies, with Stata version 14.0 (StataCorp, College Station, TX, USA).34 Statistical heterogeneity between trials was assessed for primary outcomes using I2 statistics, with values >50% indicating substantial levels of heterogeneity.35,36 Publication bias could not be assessed due to the small number of included studies, which limited the power to distinguish between finding by chance and real asymmetry.37 Subgroup analyses were performed for different dosings of celecoxib38 including 200 mg twice daily (400 mg/day), 400 mg once daily, and 400 mg twice daily (800 mg/day). Sensitivity analyses were performed based on the use of surveillance colonoscopy per protocol completer analysis (outcomes included only those subjects who underwent colonoscopy surveillance at the prespecified time period per protocol and excluded subjects who underwent a colonoscopic surveillance assessment before the expected surveillance interval), fixed-effect model, and trials with low ROB. We identified 391 records in which 11 potentially eligible articles were reviewed in full text. Of these, six articles were excluded mostly due to the lack of eligible population. Therefore, a total of five studies were included in our review. Among these five studies, three trials23,24,41 met the eligibility criteria for the quantitative analysis of primary outcomes. Post-trial results from three studies30,31,41 were included for the analysis of posttreatment effect on the incidence of recurrent adenomas. The PRISMA flow diagram depicting the search and selection process for the primary outcomes is displayed in Figure S1. Table 1 describes the characteristics of three RCTs23,24,41 which reported the incidence of recurrent colorectal adenomas. A total of 4,420 participants with a previous history of adenomas who underwent polypectomy and with documented clean colon before randomization were included in the analysis. All trials were double-blinded and placebo-controlled. The treatment duration was 3 years in two trials23,24 and 1 year in one trial.41 Postrandomization colonoscopy was performed within 1 year of discontinuing intervention in all trials. The dose per day of celecoxib used in two trials was 400 mg once daily,23,41 and the remaining trial24 tested both 400 mg (200 mg twice daily) and 800 mg (400 mg twice daily) doses. A detailed description of ROB assessment among included RCTs is presented in Table S2. Among three RCTs, one trial41 was judged to be at high ROB and the remaining two trials23,24 were judged to be at low ROB in all domains. Notes: aAdjudicated data from Solomon et al. ;19 bStudy reported the median time for taking placebo and intervention, respectively, was 13.6 and 14.2 months; cEfficacy outcomes at different time intervals were reported after discontinuing intervention; as per our protocol, we have used data from subjects undergoing colonoscopy within 1 year of discontinuing intervention; dAdvanced status uncertain for six participants. n= number of events; N= number of participants. Abbreviations: APC, Adenoma Prevention with Celecoxib trial; CRC, colorectal cancer; CV, cardiovascular; PreSAP, Prevention of Colorectal Sporadic Adenomatous Polyps Study; RCT, randomized controlled trial; Sel/Cel, Selenium and Celecoxib (Sel/Cel) Trial; NA, not available. Post-trial results from three studies30,31,41 were available to investigate the effect of celecoxib withdrawal on incidence of recurrent colorectal adenomas. Table 2 describes the identified studies. A total of 2,159 participants who completed follow-up colonoscopy after discontinuing intervention for 2–4 years were included in the analysis. Notes: aArber et al, 201130 – efficacy outcomes from 855 subjects who had colonoscopy at year 5, even if they had one or more new adenomas detected at any time after baseline; Bertagnolli et al, 200931 – efficacy outcomes from 639 subjects in the extension study with any adenoma detected at the year 5 colonoscopy; Thompson et al, 201641 – efficacy outcomes from 447 subjects with a follow-up colonoscopy within 3.5 years of qualifying colonoscopy. bStudy reported that the median time for taking placebo and intervention, respectively, was 13.6 and 14.2 months. cReported efficacy outcomes from follow-up colonoscopy within 5.5 years. dNumber of advanced adenomas uncertain for some participants. Abbreviations: APC, Adenoma Prevention with Celecoxib trial; PreSAP, Prevention of Colorectal Sporadic Adenomatous Polyps Study; RCTs, randomized controlled trials; Sel/Cel, Selenium and Celecoxib (Sel/Cel) Trial; NA, not available. Based on the results from the meta-analyses, use of celecoxib at any dose (400–800 mg/day) for a duration of approximately 1–3 years showed a statistically significant reduction in the recurrence of advanced colorectal adenomas (RR, 0.42 [95% CI, 0.34–0.53]) and any adenomas (RR, 0.67 [95% CI, 0.62–0.72]) compared with placebo, with no heterogeneity (I2=0%; Figure 1). In the sensitivity analyses (Figures S2–S4), findings were robust and consistent with the primary analysis. A subgroup analysis of celecoxib at 400 mg/day demonstrated similar effects on advanced adenomas (RR, 0.45 [95% CI, 0.35–0.58]) and any adenomas (RR, 0.69 [95% CI, 0.64–0.75]), with no heterogeneity (I2=0%; Figure 1). Both 400 mg once daily and 200 mg twice daily dosing regimens provided similar effect size (Figure S5). For celecoxib at 800 mg/day, RR for advanced adenomas was 0.34 [95% CI, 0.24–0.50] and 0.55 [95% CI, 0.48–0.64] for any adenomas. Figure 1 Effects on the primary efficacy outcomes. Notes: Efficacy outcomes measured cumulatively from baseline, on postrandomization colonoscopy performed within 1 year of discontinuing intervention. Celecoxib at any dose: 400–800 mg/day. Abbreviations: APC, Adenoma Prevention with Celecoxib trial; PreSAP, Prevention of Colorectal Sporadic Adenomatous Polyps study; Sel/Cel, Selenium and Celecoxib (Sel/Cel) Trial. Results from meta-analyses (Figure 2) showed that celecoxib at any dose for a duration of approximately 1–3 years significantly increases the risk of serious adverse events (RR, 1.15 [95% CI, 1.02–1.30]) and renal-hypertensive disorders (RR, 1.25 [95% CI, 1.09–1.42]) compared with placebo. Other safety outcomes including serious CV events (RR, 1.44 [95% CI, 0.73–2.84]), all-cause mortality (RR, 1.27 [95% CI, 0.66–2.44]), and CRCs (RR, 1.41 [95% CI, 0.24–8.27]) were not significantly increased compared to placebo. Subgroup analysis based on different dosing regimens showed that celecoxib 400 mg twice daily (800 mg/day) significantly increased the risk of serious adverse (RR, 1.2 [95% CI, 1.0–1.5]) and CV events (RR, 3.42 [95% CI, 1.56–7.46]). Interestingly, for celecoxib at 400 mg/day, a significant increase in CV risk was observed only with 200 mg twice daily regimen (RR, 2.48 [95% CI, 1.10–5.59]) but not with 400 mg once daily regimen (RR, 1.01 [95% CI, 0.70–1.46]), compared with placebo (Figures S6 and S7). Figure 2 Effects of celecoxib at any dose on the safety outcomes. Abbreviations: APC, Adenoma Prevention with Celecoxib trial; CRC, colorectal cancer; CV, cardiovascular; PreSAP, Prevention of Colorectal Sporadic Adenomatous Polyps Study; Sel/Cel, Selenium and Celecoxib (Sel/Cel) Trial. Our application of GRADE methodology led us to conclude that the accumulated evidence for celecoxib (at any dose and 400 mg/day) is of high quality for adenoma prevention. Detailed information on GRADE summary of evidence is presented in Table S3. Based on integrated analysis, we estimated that the use of celecoxib at 800 mg/day compared with placebo may lead to 108 (95% CI, 82–124) and 49 (95% CI, 30–56) fewer advanced adenomas in 1,000 patients with high-risk and low-risk adenomas, respectively. On the other hand, this would lead to an excess of 38 (95% CI, 0–95) serious adverse events and 82 (95% CI, 19–186) CV events compared with placebo. As for celecoxib at 400 mg/day, there would be 90 (95% CI, 68–106) and 41 (95% CI, 32–48) fewer advanced adenomas in persons with high-risk and low-risk adenomas, respectively. As for harm, this intervention would lead to an excess of 25 (95% CI, 2 fewer to 53 more) serious adverse events and 11 (95% CI, 8 fewer to 44 more) CV events, per 1,000 patients treated compared with placebo. The risk–benefit balance may also be different when different dosing regimens of 400 mg/day are used. Interestingly, celecoxib at 400 mg once daily may be associated with less harm since this dosing regimen would only lead to 30 excess harmful events (29 serious adverse events and one CV event) compared with 65 events (15 serious adverse events and 50 CV events) with 200 mg twice daily regimen. Based on this analysis, the risk–benefit balance of celecoxib at 400 mg/day, especially with 400 mg once daily dosing may be acceptable especially among patients at high risk of CRC and at low CV risk (Table S4). Meta-analyses of post-trial studies demonstrated no effect on the recurrence of advanced colorectal adenomas (RR, 1.15 [95% CI, 0.67–1.99]) and any adenomas (RR, 1.15 [95% CI, 0.88–1.49]) after discontinuing celecoxib for more than 2 years (Figure S8). There was moderate to substantial level of heterogeneity observed in both analyses. Previous meta-analyses suggested a substantial protective effect of non-aspirin NSAIDs on colorectal adenoma recurrence.8–12 Although the exact mechanism of action remains to be elucidated, both COX-dependent and COX-independent mechanisms have been shown to contribute to the antitumor effects. Despite such promising data, use of long-term NSAIDs for cancer prevention is not very well received due to their significant toxicity, especially CV toxicity.8,11 However, CV toxicity of NSAIDs is a complicated phenomenon, which is a result of a complex interplay mainly between baseline CV risk and the nature of each NSAID along with its dose. Celecoxib, a selective COX-2 inhibitor, is among a few NSAIDs that have been tested in a number of studies for CRC prevention. Although its efficacy in this indication looked initially promising, CV toxicity shown from cancer prevention trials thwarted the interest of the medical community. Nevertheless, a previous review has suggested that moderate dose of celecoxib (≤400 mg/day) might not be associated with an increased CV risks.26 Recently, the PRECISION trial25 which was a large, randomized, CV safety trial comparing celecoxib at ≤400 mg/day with ibuprofen and naproxen suggested that celecoxib at this dose may not confer unacceptable CV risk along with other serious adverse events. As a result, a comprehensive evaluation to understand the totality of its risk–benefit in this important indication may be warranted. Our study was designed to shed some light into this important question. To the best of our knowledge, this study combined the entire body of relative and absolute efficacy and safety of celecoxib at different doses. We also tried to gage the magnitude of risk and benefit in patients with varying risk of adenomas to increase understanding of the risk–benefit equation, which may vary with different levels of risk. Thus, a clearer picture of an agent with multidimensional effects can be seen. The results of our study showed that celecoxib demonstrated a dose-dependent effect in the reduction of adenoma recurrence and the risks of serious adverse events during a follow-up of up to 3 years. Our findings on celecoxib are consistent with those from previous meta-analyses8–10 regarding the benefits of non-aspirin NSAIDs for the prevention of recurrent adenomas. For risk–benefit balance, we found that benefit of celecoxib at 400 mg/day may outweigh the risks of adverse events in patients with high-risk adenomas. It is important to note that the absolute risk of serious CV events associated with NSAIDs was greatest among individuals with high CV risk at baseline.13,26,42 Our analysis demonstrated no significant risks of CV events in patients on celecoxib 400 mg/day for 1–3 years despite that 45% of the study population were at high CV risk. This finding is consistent with the previous meta-analysis of randomized trials which reported no significant increase in CV risk with celecoxib 400 mg/day.19,43 Data from other observational studies also support such findings.26 As a result, celecoxib 400 mg/day could potentially be considered as a viable chemopreventive agent in patients with high risk of adenomas but with low CV risk. In addition, subgroup analysis based on different dosing regimens suggested that celecoxib 400 mg once daily may have a much better safety profile on CV events compared with 200 mg twice daily. The finding that twice daily dosing may confer greater CV risk than once daily dosing of celecoxib in our study is consistent with previous meta-analysis along with other mechanistic studies.19 Twice daily dosing of celecoxib has been shown to increase blood pressure more than that in once daily dosing.44 A previous pharmacodynamic study conducted in healthy volunteers suggested that prostacyclin levels can recover to normal levels 12 hours after a single daily dose of celecoxib.45 This raised a possibility of a more complete prostacyclin inhibition with twice daily than once daily dosing which ultimately leads to higher CV risk. Several other hypotheses have been proposed to explain differences in types and dosing of NSAIDs vs CV risk including different levels of inhibition of endothelial NO synthase46 and differential effects on the enhancement of methylarginines formation.47 However, the exact mechanism of this difference remains unknown. For high-dose celecoxib (800 mg/day), despite yielding slightly higher efficacy (18 more cases of advanced adenoma prevented compared with 400 mg/day), the overall risk was most likely unacceptable. With 108 advanced adenomas prevented, the trade-off was 82 excess CV events per 1,000 patients treated with 800 mg/day of celecoxib. This finding is very much consistent with previous meta-analysis, RCTs, and observational studies which indicated a high risk of CV events with a high dose of celecoxib. As a result, celecoxib at 800 mg/day is clearly not a viable option for this indication. Of interest is the fact that no trial has ever been conducted to evaluate celecoxib at a dose of 100–200 mg/day as a chemopreventive agent. Although the efficacy of this low dose is uncertain, adverse effects of celecoxib at ≤200 mg/day would most likely be less than 400 mg/day. This may allow celecoxib to be more acceptable for long-term use if it can be demonstrated to show some efficacy for this indication at this low level of dosing. The preventive effect of celecoxib, as shown in our analysis, waned after ≥2 years of treatment cessation. The lack of a sustained clinical effect may reflect a rebound of COX-2 expression, or cessation of an alternative mechanism independent of COX-2 inhibition, as described previously.30,48 This is consistent with an increased risk of adenomas after 2 years of celecoxib discontinuation in the PreSAP trial,30 which is similar to the APPROVe study with rofecoxib.32 These data suggested that celecoxib may need to be employed on a long-term basis. Since both efficacy and adverse events can be cumulative, future study of celecoxib may need to be long term to fully elucidate the true balance on risk and benefit of this agent. Our study has several important limitations. First, the limited number of trials along with their short duration, some of which were terminated early, may not provide sufficient data to genuinely represent the long-term risk and benefit of celecoxib. Second, by using a pooled estimate of population data from the National Cancer Institute pooling project, our analysis may be limited by the nature of the source data that were derived mainly from a Caucasian population and a specific geographical area. Since significant differences exist among various subtypes of CRC across the world, the applicability of such data to other parts of the world may be limited. This is also the case for pooled estimate on CV events where different rates of CV events are seen among different racial groups and geographical areas. Third, we did not analyze the impact of aspirin use on the risk–benefit of celecoxib. This was due to the fact that we were unable to obtain patient-level data of these included trials. Aspirin could potentially alter the risk–benefit balance of celecoxib if used concomitantly. This is due to the fact that aspirin has a modest protective effect on CRC and CV events, yet possesses gastrointestinal toxicity along with major bleedings.10,49,50 As a result, readers should be aware of this limitation. Lastly, based on these limitations, our data are useful only for hypothesis generation and cannot be considered definitive. Future research on celecoxib as a chemopreventive agent may potentially be considered but must be employed at a dose of ≤400 mg either once or twice daily. In this comprehensive evaluation with risk–benefit integrated analysis, celecoxib at the dose of ≤400 mg/day could potentially be considered as a viable chemopreventive option, especially with a 400 mg once daily regimen. This may be particularly attractive in patients with high risk of adenomas but with low CV risk. Example of this patient group is a patient who has a history of high-risk adenomas and also has <5% of a 10-year risk of developing atherosclerotic CV disease. Celecoxib at a higher dose should be discouraged due to the unacceptable high level of risk compared with small benefit gained by increasing the dose beyond 400 mg/day. However, more long-term trials on celecoxib at a dose of ≤400 mg either once or twice daily are warranted to fully elucidate the true balance on risk and benefit of this agent. The corresponding authors affirm that the manuscript is an honest, accurate, and transparent account of the study being reported, that no important aspects of the study have been omitted, and that any discrepancies from the study as planned have been explained. Technical appendix and dataset are available from the corresponding author. The authors wish to thank Professor Brian L Furman, Strathclyde Institute of Pharmacy and Biomedical Sciences, Glasgow, UK, for his valuable comments and support which helped to improve the manuscript, and Mr Razman Shah Mohd Razali, reference librarian, International Medical University, for providing the full-text articles whenever needed. Strum WB. Colorectal adenomas. N Engl J Med. 2016;374(11):1065–1075. Lieberman DA, Rex DK, Winawer SJ, Giardiello FM, Johnson DA, Levin TR. Guidelines for colonoscopy surveillance after screening and polypectomy: a consensus update by the US Multi-Society Task Force on Colorectal Cancer. Gastroenterology. 2012;143(3):844–857. Hoover S, Subramanian S, Tangka FKL, et al. Patients and caregivers costs for colonoscopy-based colorectal cancer screening: experience of low-income individuals undergoing free colonoscopies. Eval Program Plann. 2017;62:81–86. Subramanian S, Bobashev G, Morris RJ. When budgets are tight, there are better options than colonoscopies for colorectal cancer screening. Health Aff. 2010;29(9):1734–1740. Ng SC, Wong SH. Colorectal cancer screening in Asia. Br Med Bull. 2013;105:29–42. Cottet V, Jooste V, Fournel I, Bouvier AM, Faivre J, Bonithon-Kopp C. Long-term risk of colorectal cancer after adenoma removal: a population-based cohort study. Gut. 2012;61(8):1180–1186. Dulai PS, Singh S, Marquez E, et al. Chemoprevention of colorectal cancer in individuals with previous colorectal neoplasia: systematic review and network meta-analysis. BMJ. 2016;355:i6188. Veettil SK, Teerawattanapong N, Ching SM, et al. 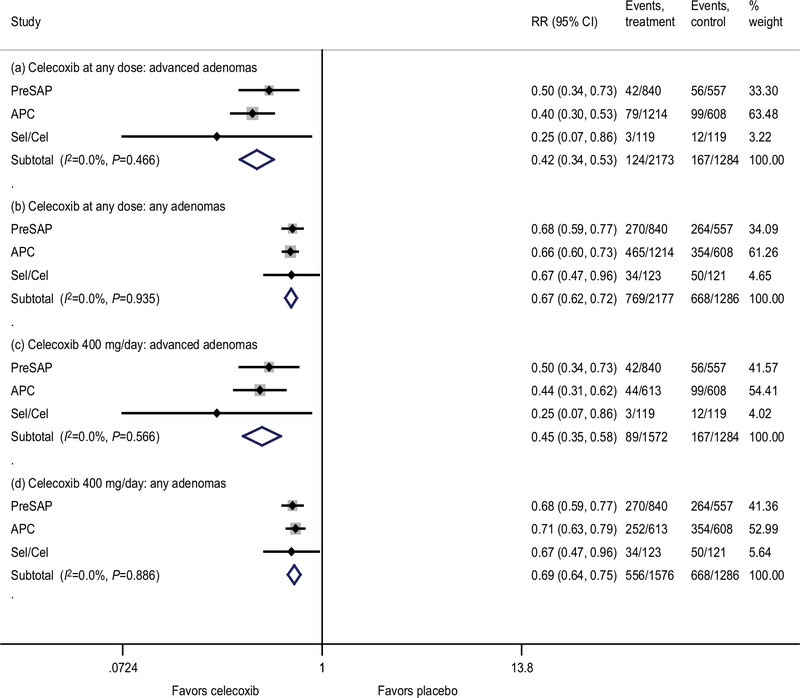 Effects of chemopreventive agents on the incidence of recurrent colorectal adenomas: a systematic review with network meta-analysis of randomized controlled trials. Onco Targets Ther. 2017;10:2689–2700. Rostom A, Dubé C, Lewin G, et al. Nonsteroidal anti-inflammatory drugs and cyclooxygenase-2 inhibitors for primary prevention of colorectal cancer: a systematic review prepared for the U.S. Preventive Services Task Force. Ann Intern Med. 2007;146(5):376–389. Dubé C, Rostom A, Lewin G, et al. The use of aspirin for primary prevention of colorectal cancer: a systematic review prepared for the U.S. Preventive Services Task Force. Ann Intern Med. 2007;146(5):365–375. Bello AE, Holt RJ. Cardiovascular risk with non-steroidal anti-inflammatory drugs: clinical implications. Drug Saf. 2014;37(11):897–902. Bresalier RS, Sandler RS, Quan H, et al. Cardiovascular events associated with rofecoxib in a colorectal adenoma chemoprevention trial. N Engl J Med. 2005;352(11):1092–1102. Bombardier C, Laine L, Reicin A, et al. Comparison of upper gastrointestinal toxicity of rofecoxib and naproxen in patients with rheumatoid arthritis. VIGOR Study Group. N Engl J Med. 2000;343(21):1520–1528. Chan FKL, Lanas A, Scheiman J, Berger MF, Nguyen H, Goldstein JL. Celecoxib versus omeprazole and diclofenac in patients with osteoarthritis and rheumatoid arthritis (CONDOR): a randomised trial. Lancet. 2010;376(9736):173–179. Aschenbrenner DS. Cardiovascular risk of celecoxib no worse than that of ibuprofen or naproxen. Am J Nurs. 2018;118(10):19. Solomon SD, Wittes J, Finn PV, et al. Cardiovascular risk of celecoxib in 6 randomized placebo-controlled trials: the cross trial safety analysis. Circulation. 2008;117(16):2104–2113. Graham D, Campen D, Hui R, et al. Risk of acute myocardial infarction and sudden cardiac death in patients treated with cyclo-oxygenase 2 selective and non-selective non-steroidal anti-inflammatory drugs: nested case-control study. Lancet. 2005;365(9458):475–481. Meek IL, Mart AFJ van de Laar, Vonkeman HE. Non-steroidal anti-inflammatory drugs: an overview of cardiovascular risks. Pharmaceuticals. 2010;3(7):2146–2162. Arber N, Eagle CJ, Spicak J, et al. Celecoxib for the prevention of colorectal adenomatous polyps. N Engl J Med. 2006;355(9):885–895. Bertagnolli MM, Eagle CJ, Zauber AG, et al. Celecoxib for the prevention of sporadic colorectal adenomas. N Engl J Med. 2006;355(9):873–884. Nissen SE, Yeomans ND, Solomon DH, et al. Cardiovascular safety of celecoxib, naproxen, or ibuprofen for arthritis. N Engl J Med. 2016;375(26):2519–2529. Mcgettigan P, Henry D. Cardiovascular risk and inhibition of cyclooxygenase: a systematic review of the observational studies of selective and nonselective inhibitors of cyclooxygenase2. JAMA. 2006;296(13):1633–1644. Veettil SK, Saokaew S, Lim KG, Ching SM, Phisalprapa P, Chaiyakunapruk N. Comparative effectiveness of chemopreventive interventions for colorectal cancer: protocol for a systematic review and network meta-analysis of randomised controlled trials. J Gastrointest Oncol. 2016;7(4):595–602. Moher D, Liberati A, Tetzlaff J, Altman DG, PRISMA Group. Preferred reporting items for systematic reviews and meta-analyses: the PRISMA statement. Ann Intern Med. 2009;151(4):W64:264–269. Short MW, Layton MC, Teer BN, Domagalski JE. Colorectal cancer screening and surveillance. Am Fam Physician. 2015;91(2):93–100. Arber N, Spicak J, Rácz I, et al. Five-year analysis of the prevention of colorectal sporadic adenomatous polyps trial. Am J Gastroenterol. 2011;106(6):1135–1146. Bertagnolli MM, Eagle CJ, Zauber AG, et al. Five-year efficacy and safety analysis of the Adenoma Prevention with Celecoxib Trial. Cancer Prev Res. 2009;2(4):310–321. Baron JA, Sandler RS, Bresalier RS, et al. A randomized trial of rofecoxib for the chemoprevention of colorectal adenomas. Gastroenterology. 2006;131(6):1674–1682. Higgins JPT, Sterne JAC, Savovic J, et al. A revised tool for assessing risk of bias in randomized trials. Cochrane Database Syst Rev. 2016;10(Suppl 1):3. Dersimonian R, Laird N. Meta-analysis in clinical trials revisited. Contemp Clin Trials. 2015;45(Pt A):139–145. Melsen WG, Bootsma MC, Rovers MM, Bonten MJ. The effects of clinical and statistical heterogeneity on the predictive values of results from meta-analyses. Clin Microbiol Infect. 2014;20(2):123–129. Sterne JA, Sutton AJ, Ioannidis JP, et al. Recommendations for examining and interpreting funnel plot asymmetry in meta-analyses of randomised controlled trials. BMJ. 2011;343:d4002. Antman EM, Bennett JS, Daugherty A, et al. Use of nonsteroidal antiinflammatory drugs: an update for clinicians: a scientific statement from the American Heart Association. Circulation. 2007;115(12):1634–1642. Brozek JL, Alk EA, Alonso-Coello P, et al. Grading quality of evidence and strength of recommendations in clinical practice guidelines. Part 1 of 3. An overview of the GRADE approach and grading quality of evidence about interventions. Allergy. 2009;64(5):669–677. Martínez ME, Baron JA, Lieberman DA, et al. A pooled analysis of advanced colorectal neoplasia diagnoses after colonoscopic polypectomy. Gastroenterology. 2009;136(3):832–841. Thompson PA, Ashbeck EL, Roe DJ, et al. Celecoxib for the prevention of colorectal adenomas: results of a suspended randomized controlled trial. J Natl Cancer Inst. 2016;108(12):djw151. Coxib and traditional NSAID Trialists’ (CNT) Collaboration. Vascular and upper gastrointestinal effects of non-steroidal anti-inflammatory drugs: meta-analyses of individual participant data from randomised trials. Lancet. 2013;382(9894):769–779. 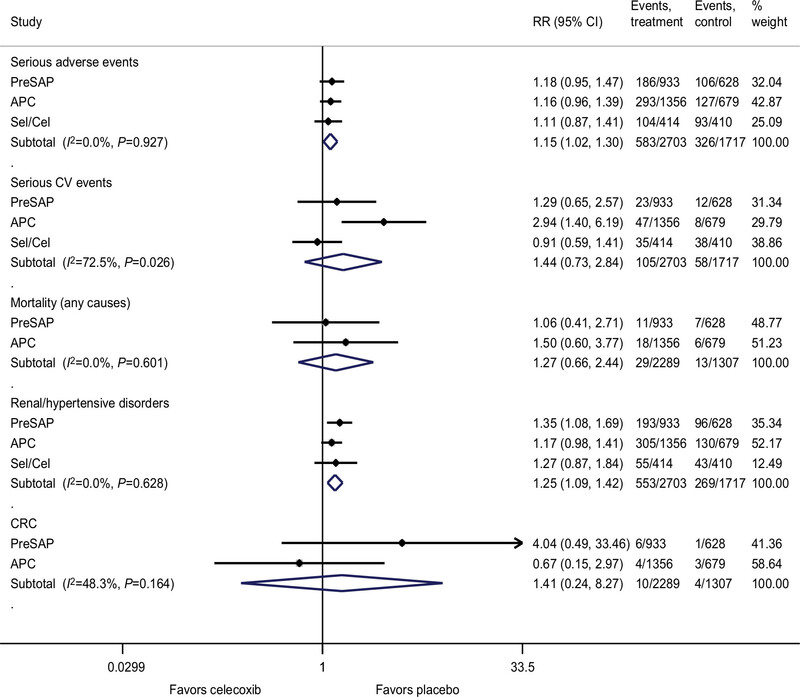 Gunter BR, Butler KA, Wallace RL, Smith SM, Harirforoosh S. Non-steroidal anti-inflammatory drug-induced cardiovascular adverse events: a meta-analysis. J Clin Pharm Ther. 2017;42(1):27–38. Solomon SD, Pfeffer MA, Mcmurray JJV, et al. Effect of celecoxib on cardiovascular events and blood pressure in two trials for the prevention of colorectal adenomas. Circulation. 2006;114(10):1028–1035. Grosser T, Fries S, Fitzgerald GA. Biological basis for the cardiovascular consequences of COX-2 inhibition: therapeutic challenges and opportunities. J Clin Invest. 2006;116(1):4–15. Yu Y, Ricciotti E, Scalia R, et al. Vascular COX-2 modulates blood pressure and thrombosis in mice. Sci Transl Med. 2012;4(132):132ra54. Grosser T, Ricciotti E, Fitzgerald GA. The cardiovascular pharmacology of nonsteroidal anti-inflammatory drugs. Trends Pharmacol Sci. 2017;38(8):733–748. Hanif R, Pittas A, Feng Y, et al. Effects of nonsteroidal anti-inflammatory drugs on proliferation and on induction of apoptosis in colon cancer cells by a prostaglandin-independent pathway. Biochem Pharmacol. 1996;52(2):237–245. Bibbins-Domingo K. Aspirin use for the primary prevention of cardiovascular disease and colorectal cancer: U.S. Preventive Services Task Force Recommendation Statement. Ann Intern Med. 2016;164(12):836–845. Veettil SK, Jinatongthai P, Nathisuwan S, et al. Efficacy and safety of chemopreventive agents on colorectal cancer incidence and mortality: systematic review and network meta-analysis. Clin Epidemiol. 2018;10:1433–1445.